by Anthony Shelton, Director of the Museum of Anthropology and Professor of Anthropology at the University of British Columbia. With continuing uncertainty over the future of Metro Vancouver’s art galleries and museums – the recent cancelation of plans to relocate the North Vancouver Museum, prevarications over funding for the construction of a new Vancouver Art Gallery, indecision over the future of the West Vancouver Museum, and the departure of one of the country’s most visionary directors from the Museum of Vancouver – the opening of the Audain Art Museum in Whistler provides a timely affirmation that art and culture are still thought important in some pockets of the province. The Audain’s official opening on the 8th March inaugurated a world-class museum that is sure to have a formidable impact on the province’s cultural profile. Over a period of just 3 and half years, the Museum, occupying 56, 000 sq. ft., raced from inception to completion. Over the past year visitors to the construction site often commented on its larger than expected footprint – not surprising given the later addition of a 8,000 sq. ft. temporary exhibition gallery which projects at an acute angle from the building’s main body. In fact the Audain is twice the size of that originally planned. The dark, sleek steel and aluminum sheafed, elevated building, nestled discreetly in a copse of spruces, has received rapturous approval and the under-stated hemlock finished interiors, are warm, elegant, and highly functional. Designed by local architects, John and Patricia Patkau, who are also behind North Vancouver’s plans for a new home for Presentation House, the Audain alongside the Museum of Anthropology are showcases for a talented pool of local architects too often given more attention abroad than at home. 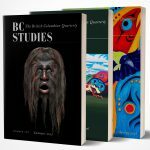 All three institutions sensitively attenuate and materialize different aspects of British Columbia’s spiritual embodiments. At a grand dinner of 700 invitees hosted at the Fairmont Chateau in a banqueting room whose walls were bedecked by branches and foliage, it was a group of artists led by Dempsey Bob that delivered the most powerful valediction of Michael Audain and Yoshiko Karasawa’s outstanding generosity and achievement. The new Museum embodies the same aspirations that motivated the establishment of the Royal British Columbia Museum, Museum of Northern British Columbia, MOA and many community museums. All, along with their associates and community partners, are dedicated to retaining and preserving the artistic and cultural legacy of the people and First Nation communities of British Columbia. All have worked to retain and return or repatriate the indigenous arts of the province, but it is the Audain, with its implicit notion of art as an embodiment of ideas and sensibilities, that most clearly expresses a history of art that begins with the works of great First Nations artists rather than those of later settlers. The Audain has constructed a new and mature version of cultural patrimony for British Columbia, which is grounded in the reconciliation of First Nation and settler populations and the ongoing repatriation of outstanding works of native art from private collections to their province of origin. The 200 works Audain and Karasawa have brought together are exhilarating. Visitors are met by Lawrence Paul’s Yuxweluptun’s aluminum cut-out housepost evoking the Squamish flood story and reiterating the indigenous sovereignty of the land. Soon after, in the foyer, the multicultural composition of the province is invoked through Paul Wong’s, No Thing is Forever, a composition of coloured neon lights representing the letters of the Latin alphabet together with a Chinese character. Every one of the many masks in the introductory gallery is exceptionally powerful. Mounted and displayed to bring out their uncompromising formal aesthetic qualities and technical virtuosity, they provide a strong statement of their makers’ visual imaginations and mastery over the medium. The first object in the exhibition gallery, a superlative 19th century Salish figurative work, appropriately enough welcomes visitors to a museum built on the unceded ancestral land of the Squamish Nation. These sculptures together with Jim Hart’s monumental carved screen covering a whole wall, make this one of the two most spectacular galleries in British Columbia. From here there opens a second gallery dedicated primarily to Emily Carr, followed by successive galleries on contemporary NWC carvers and painters, the magically naive island seascapes of E. J. Hughes, modernists including Gordon Smith, Takao Tanabe, Bill Reid, Jack Shadbolt, Frederick Varley and Lawren Harris, the photoconceptualists, and a contemporary room that juxtaposes recent works as different as those of Landon Mackenzie and Brian Jungan. It is a virtue that for the most part, the Museum doesn’t divide indigenous from non-indigenous arts, nor gets stuck in dead-end prevarications about distinguishing traditional and modernist works. It is also gratifying to see that the Audain reproduces the spectacular juxtapositions of Emily Carr’s works with First Nation art that caused such delight and enthusiasm in last year’s Dulwich Picture Gallery and the AGO’s shows on Carr. This pairing produced such powerful evocations of British Columbia that it would have been tragic not to see the strategy repeated in their home province. Now they recall a similar pairing common in New Mexico between the works of Georgia O’Keefe and native Pueblo artists and powerfully bring to mind the grandeur, affinities and cultural uniqueness of the two regions. Despite Vancouver’s seeming indifference to museums and galleries, an emerging alternate network of fine collecting institutions has started to grow outside the City’s borders. The Haida Gwaii Museum, the U’mista Cultural Centre, the Nisga’a Museum, YVR, MOA and the Audain Art Museum should be seen as bearers of our provincial identity and the stalwart visioners of a collective tomorrow. Working together and sharing resources, centres like these can make a difference in increasing the cultural integration of the province as a whole including its cities. Instead of large urban institutions, sustainability and sharing of art and cultural resources might be better achieved through networks of fine smaller and medium sized cultural organizations, which are uncompromisingly committed to excellence. The Audain invites us to re-imagine British Columbia and the institutions that best express its identity and vitality.